Opening: Long, long ago, so high in the mountains and close to the stars that on clear nights you didn’t need a lantern, lived an adventurous girl named Anja. On a snowy winter’s eve, Anja’s wish to go to a special Christmas party is answered when her cousin, Erik, arrives with his dogsled. Erik has packed everything they need for the trip, including food and blankets in the event of an emergency. The excited children set out for the party with their husky pups, Birki and Bria. Along their way they see foxes, a lynx and a bright red cardinal. Snow gently begins to fall, but by the time they leave the woods it is snowing so hard they can’t see their dogs pulling their sled. They are caught in a blizzard and are lost. Birki and Bria hear wolves howling in the distance and follow their sounds which leads them to shelter. A baby polar bear who has lost his mama in the storm, comes to their tent looking for refuge. He looks scared, so the cousins invite him into the tent. The next morning they set out to find the baby polar bear’s mama. They travel across glaciers and through beautiful frozen fjords. Can Anja, Erik and their animal friends help the little bear find his mother? Lori Evert and her husband, Per Breiehagen, creators of the bestselling The Christmas Wish, have teamed up to create their sixth enchanting and richly textured Nordic Christmas tale starring their rosy-cheeked daughter, Anja. The Polar Bear Wish is a magical tale of friendship, bravery and believing. It will give children something to wonder about and keep that special feeling of magic alive in their hearts. The setting is realistic and contributes to the fairy tale charm. Anja is bundled up in authentic 18th century Norwegian clothing and reindeer boots. She gets around on a dog sled and slender wooden skis with straps. Her rustic log house has an earthen roof covered with snow. The text is friendly and imparts information about nature and survival in the arctic. Per Breiehagen’s photograph are so mesmerizing and enchanting that children and adults will want to study them to absorb the magic of each scene. He captures this beautiful story with his breathtaking landscapes and playful scenes of Anja interacting with Birki, Erik, arctic animals and nature. The Polar Bear Wish is perfect for lap reading in front of a fire or during holiday story time. It is a Christmas treasure. Check out The Christmas Wish website which will lead you to all of the six books along with many of the beautiful and endearing photographs from each book. The family hopes their books will inspire wonder, kindness, and a love for animals and nature. Resources: Take children on a nature walk to explore the winter wonderland and the many wonders found in the fields, forests and frozen streams. Watch the cloud formations as they transform the landscape. Take along a camera and a journal and encourage kids to record birds and animals they see. Track animal footprints in the snow and make up stories. Make snow angels and build a snowman. LORI EVERT is the author of The New York Times bestseller The Christmas Wish, The Tiny Wish, The Reindeer Wish, The Brave Puppy, and The Puppy’s Wish. She and her family created The Wish books together. They split their time between Minnesota and Norway. PER BREIEHAGEN is an award-winning, internationally acclaimed photographer from Norway. His credits include National Geographic, Audubon, and The New York Times Magazine. He created the images for The Wish Books with his daughter, Anja, and wife, Lori Evert. Opening: Birki is sad today. He wishes he had a special talent like his friends. Synopsis: Birki is Anja’s husky puppy. He wishes he is special like his woodland friends. The swans fly and swim, a moose forages for food, fox camouflage themselves from predators, the sheep provide wool for Anja’s clothing, the cattle and goat provide milk, and the reindeer pulls Anja in a sleigh. But Birki is a furry ball of fluff who loves his mama and Anja. Perhaps his love and friendship are the best gifts of all. Lori Evert and her photographer husband, Per Breiehagen, return with another wintry 18th century Nordic adventure with their daughter, Anja, and her puppy, Birki. This tale is their second board book, which is perfect for small hands. The text is simple with words that are familiar, appealing and create a positive experience for young children and preschoolers who are learning to read. The Puppy’s Wish is a visual treasure, perfect for reading aloud and sharing at bedtime. Award-winning photographer Breiehagen captures the breathtaking and enchanting snow-covered landscapes, the arctic wildlife and the tender moments between Anja and Birki. This is another beautiful collaborative holiday offering by this husband-wife team, and their daughter Anja. 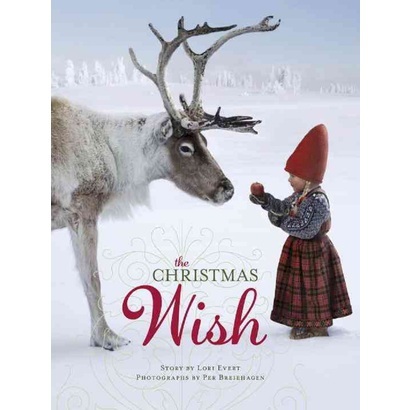 The Puppy’s Wish is the fifth Nordic treasure by the award-winning team of picture books The Christmas Wish, The Reindeer Wish, The Tiny Wish and The Brave Little Puppy (board book). This fun-loving board book is just in time for the holidays. The family hopes their books will inspire wonder, kindness, and a love for animals and nature. Visit their website. LORI EVERT is the author of The New York Times bestseller The Christmas Wish, The Tiny Wish, The Reindeer Wish and The Brave Puppy. She and her family created The Wish books together. They split their time between Minnesota and Norway. Synopsis: In this Nordic Christmas tale, Anja’s puppy is very curious. When Anja takes Birki for a ride in the basket of her sled, she doesn’t notice that her puppy falls out when she hits a bump. Brave and adorable Birki is lost and must find his way back to Anja. He sets off in the deep snow to follow Anja’s trail. Birki makes many new woodland friends on his journey — a polar bear, a wolf, a squirrel, a lynx and reindeer — who help him find his way to Anja. Lori Evert and her photographer husband, Per Breiehagen, are back with another wintry 18th century Nordic adventure with their daughter, Anja, and her puppy, Birki. This tale is a board book for small hands. With simple and engaging text appropriate for young children, The Brave Little Puppy is a visual treasure, perfect for reading aloud and sharing at bedtime. Award-winning photographer Breiehagen captures the breathtaking and enchanting snow-covered landscapes, the wildlife and the touching moments between Anja and Birki. This is another beautiful collaborative holiday offering by this husband-wife team, and their daughter Anja. The Brave Little Puppy is the fourth book in The Wish Book series: The Christmas Wish, The Tiny Wish and The Reindeer Wish. Click on The Christmas Wish website to view enlarged photos from all the books. The three books will be made into a movies, starting with The Christmas Wish in 2017. Resources: Visit Random House Kids for more information about The Wish Books. Children can select their favorite photos from the books and send holiday e-cards to friends and family. They can download and print selected photographs from the books and make their own holiday cards and ornaments. There is a video and other special activities for children. Opening: Long, long ago, far to the north and high in the snowy mountains, where you could ski for days and never see another soul, lived a kind little girl named Anja. Synopsis: Anja wants a puppy for Christmas. School is out for the holidays and she is lonely. She writes a letter to Santa and places it in the postbox. After spending Christmas Eve skiing down her favorite snowy hill, Anja finds a wild baby reindeer abandoned under a tree. Her parents let her care for the little reindeer in the hay shed. Anja is thrilled with her gift and names the reindeer Odin. Odin gets stronger daily. By spring, Odin’s antlers begin to grow. Anja and Odin become best friends and spend the summer exploring the budding countryside, the cascading waterfalls, and the mountains. As winter returns early to the arctic, Anja teaches Odin to pull a sleigh. She begins with her little sled packed with heavy sacks. By Christmas, Anja decides Odin is ready to pull her father’s sleigh. They borrow the sleigh and search for the perfect Christmas tree to decorate for Santa. On another journey with Odin, Anja sees a herd of reindeer along a ridge. She wonders if Oden would be happier living with other reindeer. How could she give up her best friend? She knows she must make a decision. Lori Evert and her husband, Per Breiehagen, have teamed up to create their second enchanting and richly textured Nordic Christmas tale featuring their rosy-cheeked daughter, Anja. The Reindeer Wish is a magical tale of friendship, bravery and believing. It will give children something to wonder about. The setting is realistic and contributes to the fairy tale charm. Anja is bundled up in authentic 18th century Norwegian clothing, reindeer boots, and slender wooden skis with straps. Her rustic log house has an earthen roof. The text is friendly and imparts information about nature and survival in the arctic. I have shared some of the story, but I have not given away the unexpected ending that will delight both children and adults. Award-winning photographer Per Breiehagen captures this beautiful story with his extraordinary photographs of breathtaking landscapes and playful scenes of Anja interacting with animals and nature. Readers will journey through the seasons in this story and experience the beautiful Northern Lights. Exquisite! This is a beautiful collaborative effort by this husband and wife team, and their daughter Anja. 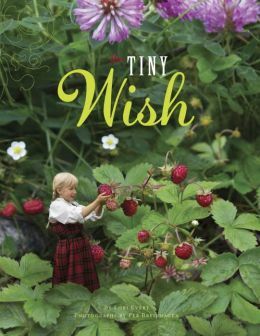 Fans of The Christmas Wish and The Tiny Wish will want to add this heartwarming treasure to their collection. It will open their hearts to the magic and wonder of Christmas. Resources: Visit the Random House for Kids for more information about the book. Click on the activity page and download The Reindeer Wish ornaments, a Santa wish list, a reindeer adventure page and coloring pages. Kids can also view a video and send a free Christmas e-card of their favorite photograph to friends. Make sure you also visit The Christmas Wish website to see enlarged pictures of all three books. Opening: Long, long ago, in the days when you could only see as much of the world as a horse could take you, lived a curious little girl named Anja. Synopsis: Anja, the kind and brave heroine of the bestselling book, The Christmas Wish, sheds her winter skis and returns in a magical springtime Scandinavian adventure. Anja visits her two cousins at their mountain farm. The three-some ride off on a big horse to check on the family’s goats. Once the goats have been accounted for, the children play a game of hide-and-seek. When Anja wishes to be tiny to win the game, her wish comes true! Just a few inches tall, she must find her way home with the help of some new animal friends. Lori Evert and her husband, Per Breiehagen, have teamed up to create another breathtaking and enchanting story featuring their daughter. Anja looks like she’s stepped out of a Scandinavian fairy tale as she celebrates and explores the arrival of Spring in the mountains and valleys. Evert’s text is simple and magical. She inspires reader’s to use their imaginations. During a game of hide-and-seek with her cousins, Anja’s favorite goat follows her and gives away her hiding places. She wants to be small, so her cousins can’t find her. When her wish comes true she has the most extraordinary adventures. She climbs onto the back of a finch and flies over fields of cotton grass, she eats wild strawberries bigger than she is, and has conversations with the most adorable gigantic animals who guide her journey home. Breiehagen’s photographs are lush and exquisite. The gorgeous scenery of green meadows, snow-capped mountains draining into overflowing streams, goats grazing in fields of cotton grass, and Anja sitting in grass as tall as trees, really make this story sing of springtime. This is a perfect book to read to children as the sun warms their faces and nature blooms around them. Resources: Visit Random House Kids for more information about the book and for activities that can be downloaded. Go on a nature walk at a nearby park and search for plants and trees that are blooming in the woods. Observe how busy the animals are. Look for birds tending to nests and listen for the sounds of new life. Check out my review of The Christmas Wish. Opening: Long, long ago, in a place so far north that the mothers never pack away the wool hats or mittens, lived a sweet little girl named Anja, who greatest dream was to become one of Santa’s Elves. Synopsis: Anja, who lives in the arctic region, dreams of being one of Santa’s elves. She watches the position of the North Star at night and memorizes the great map at school as she prepares for her trip. Leaving behind presents and a note for her family, she bundles in Nordic clothing and straps on her skis so she can travel through the deep snow. Along her way, a bird, a horse, a musk ox, a polar bear and a reindeer help Anja on her journey to find Santa Claus at the North Pole. Why I like this book: Lori Evert has written an enchanting Nordic Christmas tale that is pure magic. The author was inspired to write the story when she saw an image of her daughter, Anja, with a reindeer. Award-winning photographer Per Breiehagen captivated this beautiful story with his extraordinary photographs of breathtaking landscapes and touching scenes of Anja. This was a beautiful collaborative effort by this husband-wife team, and their daughter Anja. The Christmas Wish is a treasure you will want to keep on your book shelf for years. Visit the The Christmas Wish website to see enlarged pictures of the book and a video.